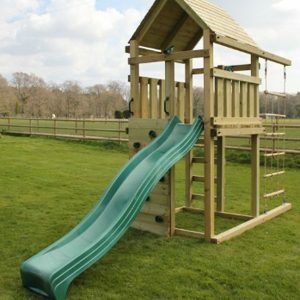 Available in the three standard Tower sizes, the Ventura Wooden Climbing Frames all include a Rockwall, Ladder, Rigging, Wooden Roof and a Wavy Slide. 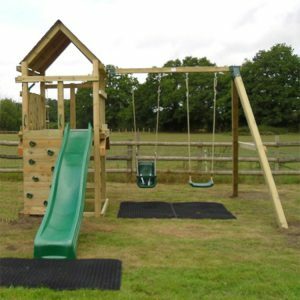 All the Ventura Play Equipment is made from slow growing Scandinavian pine which has been pressure treated against rot and infestation. We are so confident in the quality that we offer a free sample service. Simply contact us and we will post you samples of the timber we use in both the posts and the planks (e.g. deck, side walls and rockwall). 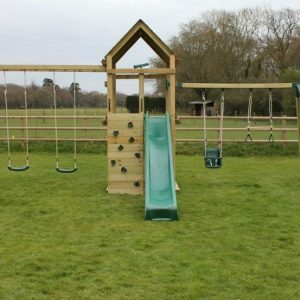 With so many options the choice can be a little confusing at first, but we are here to help and have been supplying wooden climbing frames since 2003. So please feel free to contact us. Our own JOT range of wooden climbing frame sets. The Ventura Mini Tower with Double Swing is our lowest height Ventura Tower with a platform height of 1.2m and comes complete with ladder, slide, rockwall, rope ladder, double swing arm and two seats! Our own JOT range of wooden climbing frame sets. 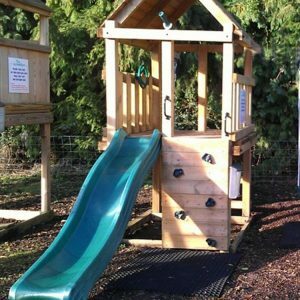 The Ventura Mini Tower with Monkey Beam is our lowest height Ventura Tower with a platform height of 1.2m and comes complete with ladder, slide, rockwall, rope ladder, Monkey Beam and two swings. 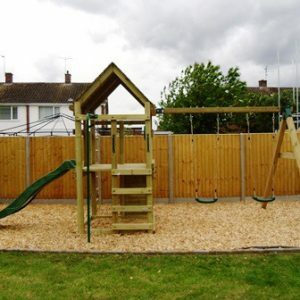 Our JOT range of wooden climbing frame and swing sets. This Ventura Midi Tower, Monkey Beam and Swing Arm set has a platform height of 1.5m and comes with all the possible climbing, sliding and swinging accessories to entertain all children. Choose from a single, double or nest Swing Arm.